Late last month, we saw McDonald’s France taking a big long jab at burger rivals Burger King. 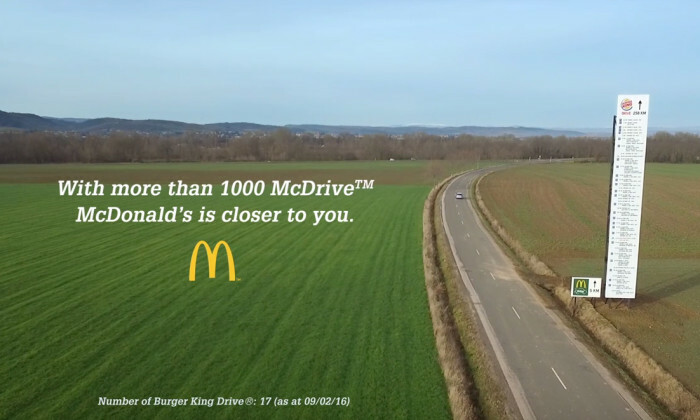 McD’s, with the help of TBWAParis, put up a billboard playing up on the distance a consumer needs to travel to get a bite of the King’s burgers – as compared to just a short one to the nearest McD’s drive through. Burger King, has now retaliated, giving the ad its own little twist at the end. Despite a drop in newspaper profits, the SCMP Group saw its full year revenue exceed HK$1 billion in 2012, driven largely by a str.. The app will enable premier banking customers to communicate with their relationship managers securely via Whatsapp, WeChat and LI.. The alliance enables brands to reach China’s fast-growing consumer base through digitally embedded brand advertising in popular p..